Posted on Dec-23-2016 by Rabih Dannaoui wrote in blog.It has 0 Comment. 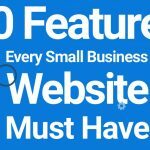 If you are planning on setting up a new website for your small business, then you are in luck. 99 media lab have put together this wonderful infographic that list all the necessary 50 tips on what every website should have, do you agree? and what you would add to this infographic?